Almost half of British parents are either prepared to risk being fined, or already have been, for taking their children out of school during term time to go on holiday, a new survey has revealed. UK foreign exchange company World First surveyed 1,000 parents from across the UK to find 45 per cent would pay a £60 fine, while almost four percent admitted they have already paid the sum. 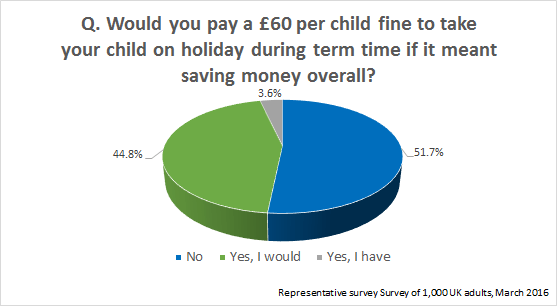 Parents in England were the most willing to pay the fine and take their children on holiday (46 per cent), and those in Scotland the least (31 per cent). Parents in Northern Ireland were also the most likely to admit to having already paid the fine. Currently, local councils can hit parents with a fine of £60, which rises to £120 if they don’t pay within 21 days, after the Government cracked down on term time holidays in 2013. Prosecution is used as a last resort if the latter is not paid after 28 days, resulting in a fine of up to £2,500, a community order, or a three-month jail sentence. Head of communications at World First, Matt James, acknowledged that parents know travel companies hike their prices for getaways during the school holidays, with the potential for “big savings” making it a tempting proposition to holiday during school time instead.